Tanzania is the best safari destination in Africa. There's an incredible amount of wildlife in a wide variety of national Parks, some of which only receive a hand full of tourists every year. The most popular safaris in Tanzania (and the least expensive) usually include several parks in the North of the country. Since you can fly into Kilimanjaro International Airport (situated between the towns of Arusha and Moshi) you can also avoid spending too much time in urban areas and get into the bush as quickly as possible. Many safari goers these days are as interested in visiting local tribes as they are spotting the "Big Five". Most safaris will include a visit to a Maasai village, school or an organized hunt with the local Hadzabe. The annual migration of millions of wildebeest and zebra is a truly remarkable wildlife show and worth planning for. The best time to witness the migration is probably February - March when the wildebeest and zebra have their young. Not only can you enjoy seeing baby animals, but the predators are at the highest number too. Because the herds also concentrate in the south of the Serengeti, it's easy to plan your wildlife viewing in that area and find a safari company that offers lodging there (see below). Tanzania is still worth visiting during the shoulder season; you'll be able to witness some wonderful wildlife, undisturbed by other tourists. The low-season is May - June when the heavy rains make many roads simply impassable. Rain also means that water is plentiful and the animals are able to scatter over a wider area -- making it more difficult for you to spot them. More on Tanzania's climate and more about -- Best time to visit Tanzania. The Northern parks include the Serengeti, Ngorongoro, Lake Manyara, and Tarangire. You can see more wildlife you thought possible and enjoy several different parks with unique features. The Serengeti and the Ngorongoro Conservation Area is where you can witness the incredible migration of millions of wildebeest and zebra -- followed enthusiastically by their predators. You should budget at least 5 days for a decent safari. Northern Tanzania is home to several tribes most notably the Maasai and the Hadzabe. 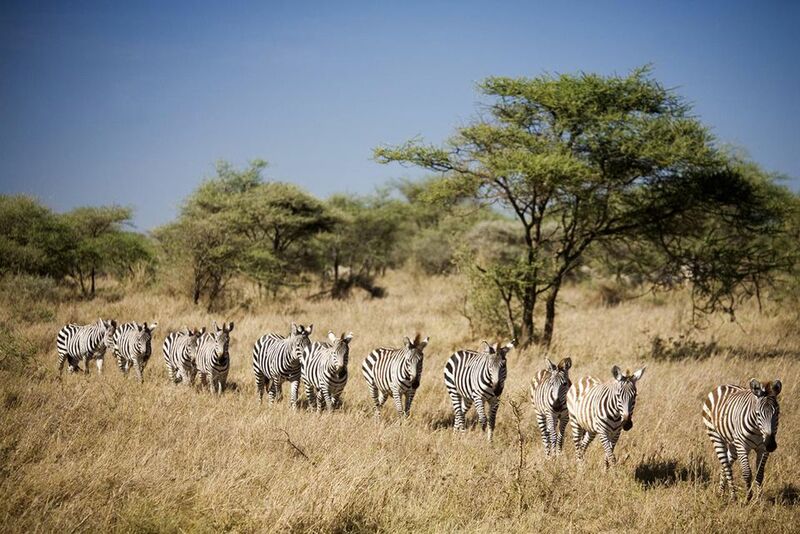 The Serengeti National Park in Tanzania offers the absolute classic African safari setting. The grasslands make the Serengeti fantastic for spotting lion kills because you can see the whole spectacle clearly. The migration of millions of wildebeest and zebra starts here, and because it's much larger than the Masai Mara in Kenya, the park is less densely populated with minibuses full of tourists.There are 5 basic sections of the Serengeti Park, each with its unique environment and corresponding wildlife patterns. Find out more from this detailed ATS guide so you can plan the best place to lodge or camp when you go, to maximize your wildlife viewing opportunities. The Ngorongoro Conservation area borders the Serengeti in northern Tanzania and includes the world's largest crater which acts as a natural enclosure for almost every species of wildlife found in East Africa. This includes the very rare black rhino. The Ngorongoro Crater is where you'll witness some of the densest population of wildlife in the world and it's a truly amazing place for photographers. The Maasai still live within the conservation area, and it's also home to Olduvai where some of man's earliest remains have been found.There are several lodges and campsites in the Conservation area. Lake Manyara is a relatively small national park but it's incredibly diverse. Lake Manyara boasts plenty of elephants, tree-climbing lions (getting rarer), leopards, giraffes and more than 400 species of birds including flocks of pink flamingos.Most tour itineraries stop at Lake Manyara for a night en route to the Serengeti and Ngorongoro (or on the way back to Arusha). Tarangire, like Lake Manyara, is often combined with a visit to the larger, better known Serengeti and Ngorongoro parks. But during the dry season, (June to October) the river beds just teem with animals and it is well worth a trip.Tarangire is a good place to enjoy a walking safaris and an excellent place to view elephants. Be prepared to swat tsetse flies here, at certain times of the year they can get annoying. Mount Kilimanjaro: Africa's highest peak offers a breathtaking 6 day hike to its summit. Mount Meru: Tanzania's second highest peak offers a 4 day hike to its summit (13,700 feet), a great alternative to Kilimanjaro. Lake Eyasi offers a peaceful place to camp, incredible birdlife and an unbeatable cultural experience with local Hadzabe, Tanzania's "bushmen". Zanzibar: Zanzibar is one of Tanzania's biggest tourist draws and a popular add-on after a dusty safari. You can enjoy spice tours, Stone Town, snorkeling, scuba diving and much more. Most safaris in Tanzania include parks in the north of the country like the Serengeti and the Ngorongoro crater. But Tanzania's southern parks are more coveted by safari aficionados. If you want a real bush experience without the tourist minibuses, then you should include the parks described below in your itinerary. Most accommodations are at the high-end of the price range because they are intimate and cater to small groups. The southern national parks offer a truly wild experience. If you're flying into Dar es Salaam, Mikumi National Park is easily accessible by road. But in most cases you'll catch a flight on a small aircraft to reach these parks and reserves. Best time to Visit the Southern CircuitThe best time to visit parks in Southern Tanzania is during the dry season (June - November) because the roads are passable and you can actually drive around (which helps on safari!). The dry season also means that the game is more concentrated around the rivers that run through these vast parks, thus making it easier to spot wildlife. From December - March you get more chance of seeing young animals but the weather is very hot and humid. More about Tanzania's Climate, and more about -- Best time to visit Tanzania. Selous is Africa's largest reserve, a world heritage site, and not nearly as crowded as the Serengeti. You can see elephants, cheetahs, black rhinos, African hunting dogs, and plenty of hippos and crocodiles. The Selous swamps, rivers and wetlands allow tourists to enjoy their safari by boat which is a big draw. Walking safaris are also popular here and you can also enjoy night drives.Selous Game Reserve has problems with poaching and sometimes the wildlife is skittish because of this. Apparently the area is not suited for cattle because of the high prevalence of tsetse flies. Local folks therefore hunt wildlife for their meat and naturally poaching for game trophies, ivory, etc. is still prevalent. Hopefully with more visitors, the park will receive more money and be able to patrol more effectively. Ruaha is remote, large, and full of wildlife -- especially elephants. There are also lions, cheetah, leopard, lots of kudu and almost every other African mammal you'd like to see. The park is home to the Great Ruaha River and it's here during the dry season (May to December) that you get some spectacular game viewing.Ruaha is only accessible by light aircraft and it's suggested you stay at least 4 nights to make it a worthwhile trip. This also gives you enough time to explore this huge area of unspoiled African wilderness. Luckily the accommodations in Ruaha mean it's a pleasure to spend several nights. Mikumi National Park is very accessible from Dar es Salaam (a four hour drive) and is therefore the most visited park by local Tanzanians. The National Park borders Selous and shares its abundant wildlife including lions, giraffe, buffalo, eland, African hunting dog and many more.Mikumi is a good stop over point if you're on your way to Selous or Ruaha. The best time to visit is June through February during the dry-season. There are several places to stay inside Mikumi National Park. If you're on a budget there are a few guest houses in the village outside the park where you can also organize a safari from. Udzungwa Mountains National Park is a two hour drive from Mikumi and is famous for its bio-diversity. If you like rare plant life and rainforests with enchanting waterfalls, it's well worth a trip. Saadani National Park is a nice mixture of bush and beach. Situated on the Indian Ocean facing the island of Zanzibar, Saadani is accessible from Dar es Salaam by road (4 hours) or charter flight. You can see lots of hippos, crocodiles, and elephant. Boat safaris and walking safaris are popular here. Best time to go is January to February and from June to August. Zanzibar: Zanzibar is one of Tanzania's biggest tourist draws and a popular add-on after a dusty safari. Stone Town, in the heart of the main island is a UNESCO World Heritage Site. The streets are perfectly preserved in this ancient trading town. You can also enjoy spice tours, snorkeling, scuba diving and much more. Western Tanzania is the least visited part of Tanzania but perhaps the most interesting for travelers with a sense of adventure. Western Tanzania is also where you can see chimpanzees in their natural habitat. There are two parks you can see chimpanzees (see below) but note that children under 10 are usually not allowed to track these primates. You should budget at least 4 days to visit western Tanzania's parks. The best time to visit parks in Western Tanzania is during the dry season (June - November) because the roads within the parks are passable. The dry season also means that the game is more concentrated around the rivers that run through these vast parks, thus making it easier to spot wildlife. When viewing chimpanzees though, the wet-season (December to April) makes it a little easier to find the chimps since they don't have to roam too far to get water. More about Tanzania's Climate, and more about -- Best time to visit Tanzania. Katavi has all the credentials of being a top wildlife destination in Africa. It is teeming with animals, beautiful and unspoiled. The reason Katavi sees so few visitors is because it is so remote. This is a good reason to visit if you're looking for a unique safari experience since there are only two camps and it's only accessible by light aircraft. Check out Chada Katavi it's an excellent camp (but not cheap). Katavi is best during the dry season where the pools are literally filled to the brim with as many as 3000 hippos. Gombe Stream National Park is home to several groups of habituated chimpanzees. While it's Tanzania's smallest park, it is certainly one of the most important. Gombe is where Jane Goodall studied chimpanzees and brought home to us how closely we are related, in all ways, to our genetic cousins.Gombe is situated on the shores of Lake Tanganyika, so you can enjoy the beach as well as the wildlife. Gombe is really difficult to get to by road, it's best to take a light aircraft from Dar es Salaam or Mwanza. Tracking chimpanzees is easier during the wet-season when they don't roam too far. But the dry season during July to October is better for taking photographs, when the foliage is less dense. December is also a good time to visit. Mahale is another chimpanzee sanctuary, with an estimated 1000 chimps in residence. There are other primates to see too, including the red colobus and yellow baboons. Like Gombe, Mahale lies in the shores of Lake Tanganyika.The best time to visit Mahale is during the dry season from May to October. A visit to Mahale is often combined with at least a few nights in Katavi. Mahale is linked by chartered aircraft to Dar es Salaam, Arusha and Kigoma. Places to stay are limited; one of the best camps in Africa is located here - Greystoke Mahale. It books up years in advance. You can also try Nkungwe Tented Camp. Rubondo is an island situated in south-west Lake Victoria (the world's second largest lake). An amazing place for birdlife and you can also enjoy chimpanzees, giraffe, elephant and other mammals introduced to the island. Accommodation is limited to 10 luxury tents, but this means you'll have the beaches almost to yourself. Zanzibar is one of Tanzania's biggest tourist draws and a popular add-on after a dusty safari. Stone Town, in the heart of the main island is a UNESCO World Heritage Site. The streets are perfectly preserved in this ancient trading town. You can also enjoy spice tours, snorkeling, scuba diving and much more. Park entry fees differ per national park. The fees listed are valid for a single day. Some parks also require you to take a guide and that fee is usually around USD 10. Tanzanian nationals are allowed to pay fees in Tanzanian shillings; everyone else needs to pay in US Dollars. The current rates for the Serengeti are USD 80 per person per day; Tarangire and Lake Manyara are USD 45; Katavi and Ruaha are USD 40 per day. The Ngorongoro Reservation Area is a mixed up bundle of fees and regulations where it costs USD 60 per person to enter the Conservation Area, but another USD 100 per vehicle entering the Crater (for 6 hours). Kilimanjaro National Park charges USD 60 per day, so if you're hiking up the mountain, be prepared to pay at least USD 300 in park fees. If you're planning a safari in Northern Tanzania, the best airport to arrive at is Kilimanjaro International Airport (KIA). KLM has daily flights from Amsterdam. Ethiopian and Kenya Airways also fly into KIA. If you're planning a safari in the south and west of Tanzania, most itineraries will start in Dar es Salaam. European carriers that fly into Dar es Salaam include British Airways, KLM and Swissair (which codeshares with Delta). Regional flights to Dar es Salaam, Zanzibar and parts of northern Tanzania regularly fly from Nairobi (Kenya Airways, Air Kenya) and Addis Ababa (Ethiopian Airlines). If you wish to combine a Tanzania safari with a Kenyan safari, there are several border crossings available. Buses regularly go from Mombasa to Dar es Salaam, Nairobi to Dar es Salaam, Nairobi to Arusha, and Voi to Moshi. If you're on a tour that combines the two countries, transport will be included and usually involves a bus drive from Nairobi to Arusha (5 hours). Many tourists on safari in Tanzania will be on a tour which will include transportation. The most common safari vehicle is the jeep. Most safari jeeps are open and you'll get nice and dusty while bouncing along the dirt roads. The open roof gives you better opportunities to photograph the animals. The cheaper your safari, the more likely you'll be traveling in small minibuses around the game parks. If you're booking a safari with a tour operator the flights between reserves will usually be included, especially if you're on the southern or western circuit. You can enjoy a hot air balloon safari in the Serengeti and Selous National Parks. Flights include breakfast and a champagne toast at the end of the flight. Prices start at USD 450 per person. (No children under 7). Self-Drive Safaris in TanzaniaIf you're planning to see the major parks in Northern Tanzania, then renting your own car is well worth it. The road from Arusha to the Serengeti takes you to Lake Manyara and the Ngorongoro Crater. It's in reasonable condition too, although getting to your campsite may not be as easy once you're within the park gates. For the rest of the country, renting a car isn't highly recommended just because the roads aren't very good to say the least, petrol is expensive and the whole experience may take some of the pleasure off of enjoying your beautiful surroundings. If you have friends with a car who live in Tanzania, let them drive you. Car rental information and rates: Green Car Rentals; Africapoint; South Travels. Most safari tours operators will have set lodgings they use per itinerary. If you're planning your safari independently, below is a list of various hotels and companies that operate lodges and tented camps around Tanzania. These are all fairly luxurious and certainly spectacular in their settings. Moivaro Lodges and Tented Camps are located in Arusha, Serengeti, Lake Natron, Lake Manyara, Stone Town and Fumba Beach. Elewana Afrika Luxury Lodges and Camps are located in Arusha, Serengeti and Tarangire. Serena Hotels and Safari Lodges are located in Arusha, Ngorongoro, Lake Manyara, Serengeti (including 2 tented camps) and Zanzibar. Sopa Lodges are located in the Serengeti, Ngorongoro and Tarangire National Parks. Nomad Tanzania is a safari tour operator which owns exclusive camps in Katavi, Mahale and Selous. They also run several mobile-tented camps in the Serengeti and Tarangire. For more lodges in Tanzania see this comprehensive list of accommodations. This is a basic packing list. It's important to remember to pack light especially if you're taking charter flights between parks because the baggage weight is limited to 10-15 kg's (25 - 30 lbs) maximum. Tips are normally given for good service in Tanzania. In restaurants and hotels a 10% tip is normal. For guides and drivers USD 10-15 a day is acceptable. If you're not sure who to tip or how much, ask your tour representative for advice. Below are tour operators that I believe encourage responsible tourism in Tanzania. This means that they will ensure you have a great experience without harming the environment,the wildlife, and people that live there. While it is often cheaper to book a safari locally once you get to a country, the touts in Arusha are pushy and not always honest. Check with the local tourist information center first to make sure your "cheap safari" is not on the blacklist. If you have questions about planning your safari, you can see all my safari articles here, and you can also always e-mail me. If you're interested in seeing the profits of your safari returned to the local community, then booking with a local tour operator ensures this to some extent. However, just because a company is local, doesn't mean its regard for its employees, the environment and local communities is necessarily better than foreign owned safari companies. The safari operators listed below are to the best of my knowledge, eco-friendly and community friendly outfits. Chimpanzee Safaris are specialists in organizing safaris to Gombe, Mahale, Katavi and Tarangire National Parks. Serengeti Pride Safaris offer custom Kilimanjaro Climbs and safaris throughout Tanzania as well as cultural tours. JMT African Heart Expeditions offers both budget and luxury safaris throughout Tanzania. My Serengeti Safari a small company that specializes in custom budget safaris throughout Tanzania. Karibu Safaris offer excellent birding and horse riding safaris. Kibo Guides offer safaris throughout Tanzania and are pleased to accept families with young children. Locally owned and operated, Kibo safaris are dedicated to helping local communities and have recently built a school. Maasai Wanderings are a family-owned and operated safari company offering safaris in Northern Tanzania. Maasai Wanderings opened their own school to support the local Maasai community which you can visit on your safari. Nomad Tanzania offer luxury safaris in the true wilderness of Tanzania. They operate a grand lodge called Sand Rivers Selous, the fantasy camp of Greystoke Mahale, camp Chada Katavi, and a collection of mobile camps traveling around northern Tanzania. Roy Safaris is a highly regarded safari operator offering safaris mainly in Northern Tanzania, as well as cultural tours, Kilimanjaro Treks and more. They can organize custom safaris in other parts of the country as well and are competitively priced. Tent With a View Safaris: Offers mobile tented safaris in Saadani and Selous. The safari companies listed below practice the highest levels of "responsible tourism" to the best of my knowledge. In most cases, a portion of their profits go towards building and supporting local schools, medical clinics and conservation projects. African Portfolio offers customized luxury safaris throughout Tanzania with gorilla trekking add-ons, Zanzibar and more. Mix and match any quality safari camp or lodge to suit your interests. Abercrombie and Kent offers classic luxury safaris in Northern Tanzania. Nothing off the beaten track and well-organized; a good choice if it's your first safari and you enjoy your comforts. andBeyond offers luxury safaris with exclusive tented camps in both northern and southern Tanzania. andBeyond has an excellent reputation as a leader in conservation. Natural High Safaris offer Tanzanian safaris for all budgets and cover all types of safaris from mobile-tented to walking safaris. Responsible Travel is a British based tour operator that selects tours based on their eco-friendly reputation. You can be sure that all safaris listed are not detrimental to the environment or local communities. Tanzania Odyssey A British based tour operator who specializes in Tanzania and covers all destinations in the country. This operator offers tailor-made vacations and is especially popular with honeymooners. Thomson Safaris has been exclusively operating in Tanzania for 25 years. They run several humanitarian projects, and only use local staff and guides. Thomson offers a wide range of Tanzanian itineraries and is very well respected. Journey to Africa offers customized safaris to Tanzania to suit all budgets. They are based in the US and will help you plan every part of your safari. Tanzania Safari Journals: Firsthand accounts of peoples' experience planning and going on safari in Tanzania. There are tips on avoiding sub-standard tour operators, what to pack, what to expect and more. Tanzania Adventure Stories from independent travelers listed on one of my favorite travel web sites, BootsnAll Travel. Travelblogs from Tanzania: Find out what travelers are experiencing right now as they travel in Tanzania. Safari in Tanzania Podcast: Listen to an account of a safari in Northern Tanzania.